Follow up from yesterday: no severe weather reported. 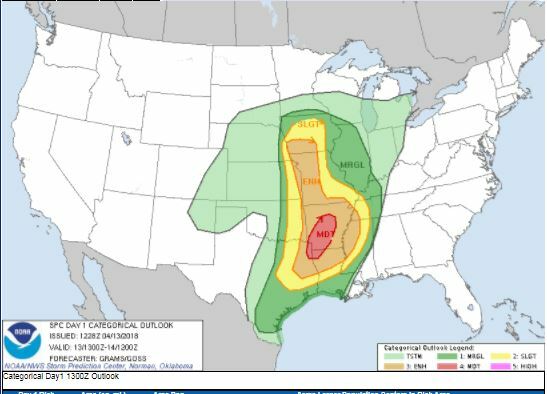 The Storm Prediction Center (SPC) has issued a Moderate Risk for most of Arkansas, northern Louisiana and the northeastern corner of Texas. Associated with the Moderate Risk is a 15% Hatched Tornado Threat Ring. Synoptically speaking, the 250 mb NAM chart shows a deep trough moving into the Great Plains today. 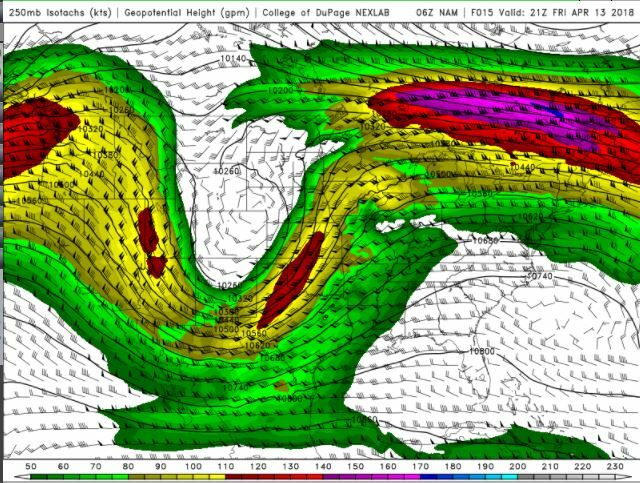 The threat for severe weather is just east of the trough. The 500 mb NAM chart large swaths of strong positive vorticity associated with the trough. 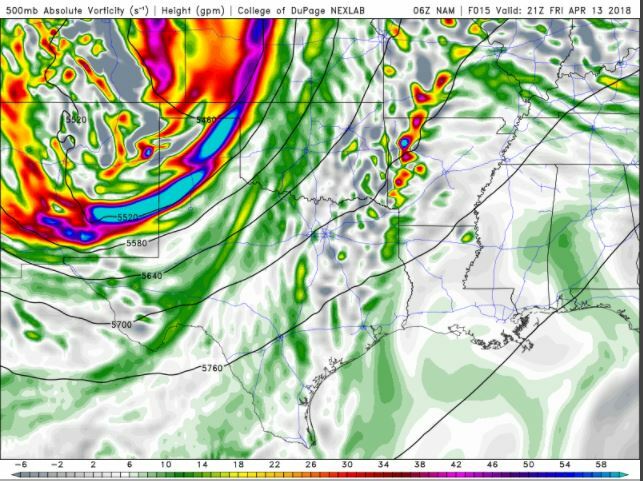 The important vorticity for today’s severe weather threat will be the pockets of vorticity in eastern Arkansas by 21 Z, as shown on this chart. 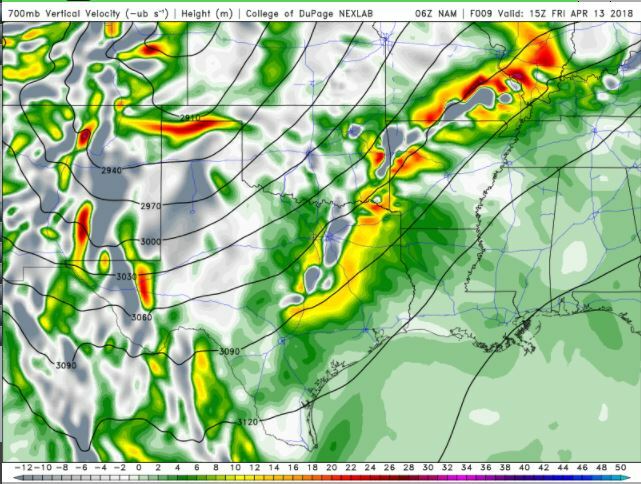 The 700 mb NAM chart shows large swaths of rapidly-rising air along the I-30 corridor. The 850 mb NAM chart shows pockets of moderate thermal advection, both warm and cold. I need to learn more about this chart. If I see strong advection one way or another, it’s a frontal boundary. This is more like a mess. 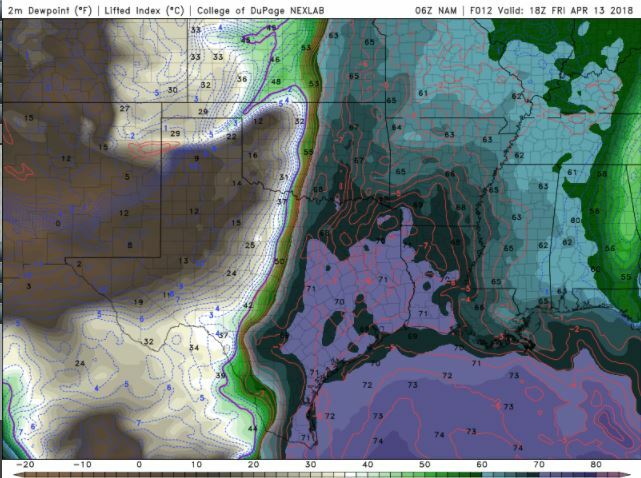 The surface dewpoints (NAM) show that storms will fire well ahead of the dryline. Dewpoints in the mid to upper 60’s show that there is ample moisture in the Moderate Risk area. 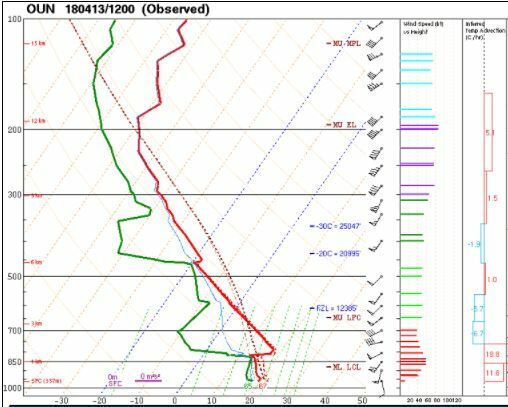 The 12Z upper air sounding from Norman, OK, shows a capped, but slightly energetic atmosphere. There was 1442 J/kg of Convective Available Potential Energy (CAPE) and -236 J/kg of Convective Inhibition (CINH). There was a large cap, and the 0-3 km average lapse rate was 4.9 C/km. 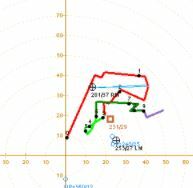 The Lifted Condensation Level (LCL) was only 163 m.
The hodograph from Norman, OK, shows 47 kts of low-level shear and 52 kts of deep-layer shear. 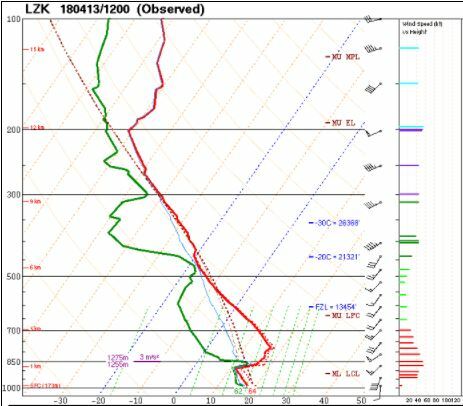 Closer to the threat area, the 12Z upper air sounding from Little Rock, AR, shows a less energetic atmosphere. There was only 99 J/kg of CAPE and -690 J/kg of CINH. Once again, there was a large capping inversion, and the 0-3 km average lapse rate was only 3.2 J/kg. 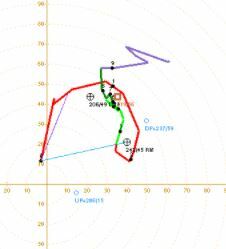 The LCL was 140 m.
The hodograph in Little Rock, AR, shows 47 kts of low-level shear, and 17 kts of deep-layer shear. Currently, the surface observations (from the SPC Mesoscale Analysis Map) show mild, humid, and cloudy conditions over the Moderate Risk area. Surface winds from the southeast continue to advect warm, moist air into the region. 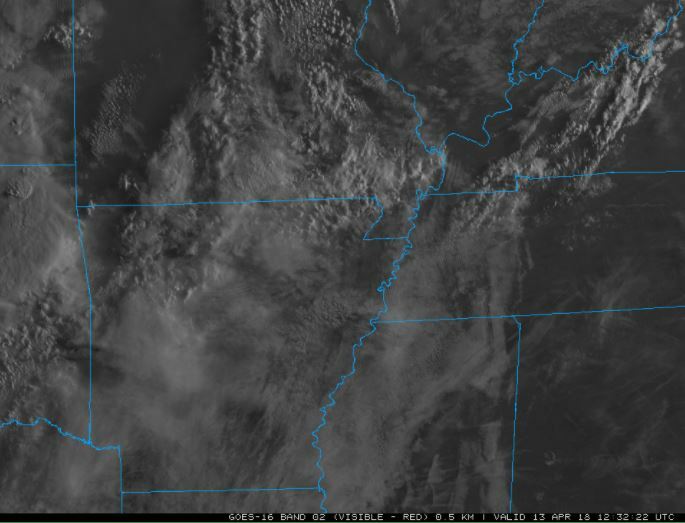 Visible satellite imagery shows cumulus development in the heavy cloud cover. Overall, I think there is a strong severe threat today. 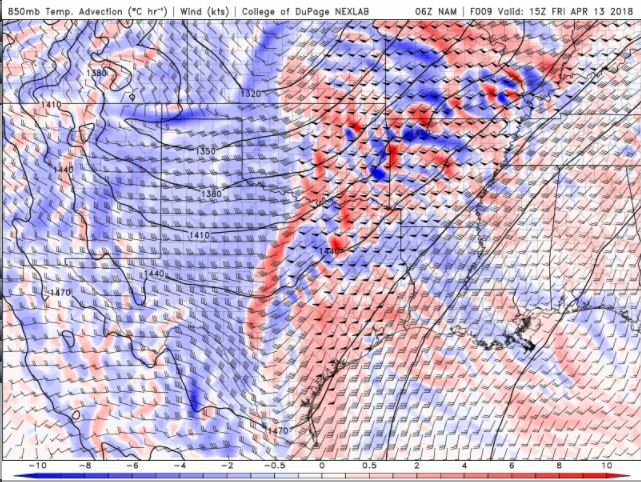 Given the strong shear, tornadoes are likely. If I were chasing today, I would pick somewhere near Texarkana and just glide up and down the I-30 corridor. However, this is awful chase country. Hills and trees are everywhere. Also, these storms will likely form clusters quickly, given the strong forcing. 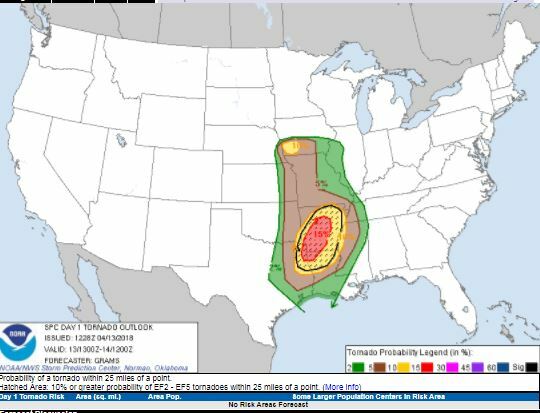 This entry was posted in Follow Up, Practicing Concepts, Predictions, Satellite Imagery, Severe Weather and tagged 15% hatched tornado ring, forecast, meteorology, moderate risk, severe weather, weather. Bookmark the permalink.